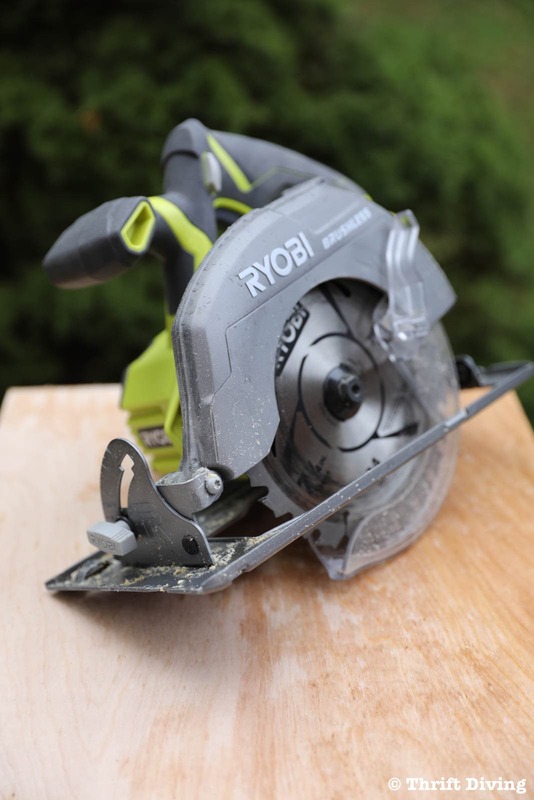 This post on how to use a circular saw is brought to you in part by RYOBI Power Tools. After doing an in-depth review of how to use a jigsaw, I have been dying to do another video on how to use a circular saw. When I first started DIY’ing, it was all about painting furniture, but eventually, I got tired of just painting furniture. I wanted to cut off legs…make a new top…add wood here and there… The only way to do that was to learn how to use power tools, and so I did. Now it’s your turn, my friend! That’s where this Power Tools 101 series comes in. This series is all about teaching you what you need to learn so that you can safely and easily use power tools, too. So let’s jump right in! *NOTE: Be sure you completely read the manual before using your circular saw. If you know nothing about circular saws, you’re probably wondering what a circular saw is even used for. It gets confusing, right? With so many saws on the market, why do you need this for your DIY toolbox? 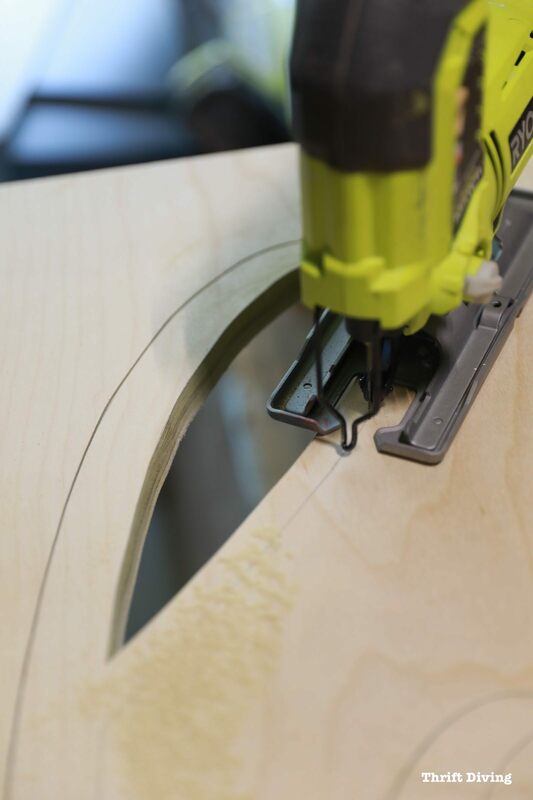 Let’s just say that if you have a circular saw, you can quickly make 9 different cuts with it–cuts that you could also make with a table saw. But which one is more portable? Yep–a circular saw. In my opinion, it’s also less intimidating to use a circular saw it is to use a table saw, am I right? Crosscut – Cuts that cut across the grain of wood. Rip cut – Cuts that cut with the grain of the wood. Dado – A shallow cut that goes across the grain of wood but isn’t deep enough to cut through the wood. You’d make a dado cut for shelves and other things where you need a shallow cut, but not go all the way through. 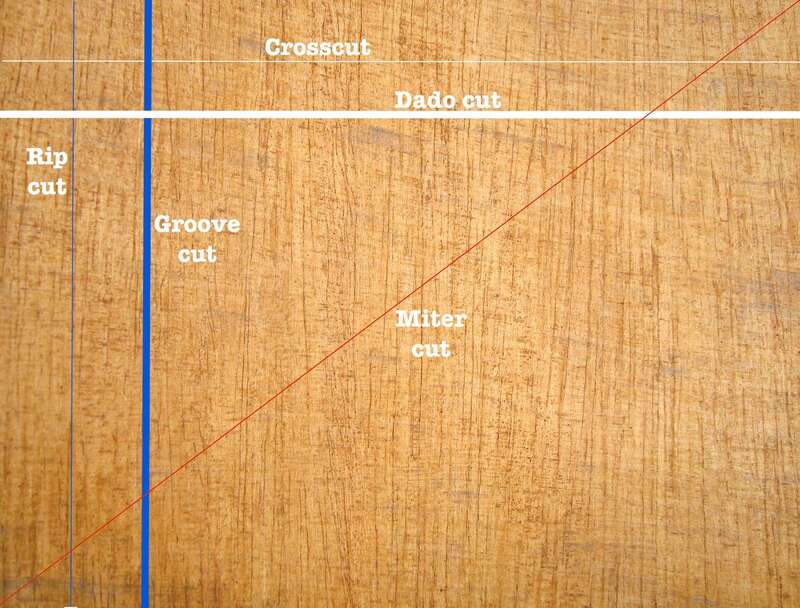 Groove – A groove is similar to a dado cut, except it’s a shallow cut that goes with the grain of the wood and doesn’t cut all the way through. Miter cut – An angle cut at 45 degrees on the face of the board, such that when combined with another 45-degree cut, can make a 90-degree corner (etc. picture frames). Bevel cuts – Cuts that are angles cuts cut on the edge of a board, such as those used to make french cleats like I made to hang up these DIY garden fence planters. Compound miter cuts – Cuts that are made at an angle on the face as well as having a beveled edge. Plunge cuts – Cuts that are made in the middle of a piece of a material by plunging your saw blade in an interior part of the material instead of starting your cut from the edge. This is a beveled edge, cut with a circular saw. So if you can make all these types of cuts with a circular saw, why would you even need a table saw, right? Nooooot quite. I think if you’re someone who does a lot of woodworking, a table saw has its place in a workshop because you can very quickly make cuts, repeating the same cuts over and over again, without making any adjustments. That’s super helpful. But you can’t ignore the space-saving and portability of a circular saw. 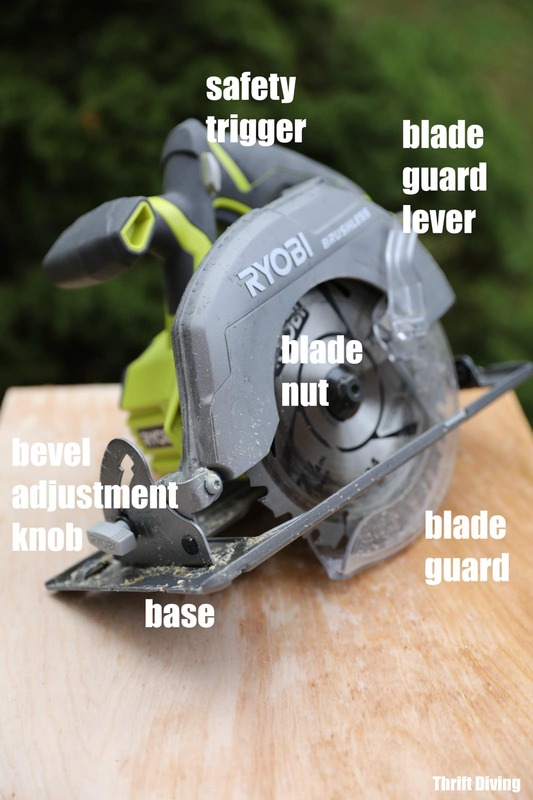 Here are 5 of the 9 types of cuts you can make with a circular saw. What Can You Cut With a Circular Saw? What you cut will depend on the type of blade you use. So just be sure you’ve got the appropriate blade for the material you’re cutting. Also, note that not all circular saws can cut concrete. Just make sure you read the manual to know what materials are appropriate for cutting with that particular circular saw. 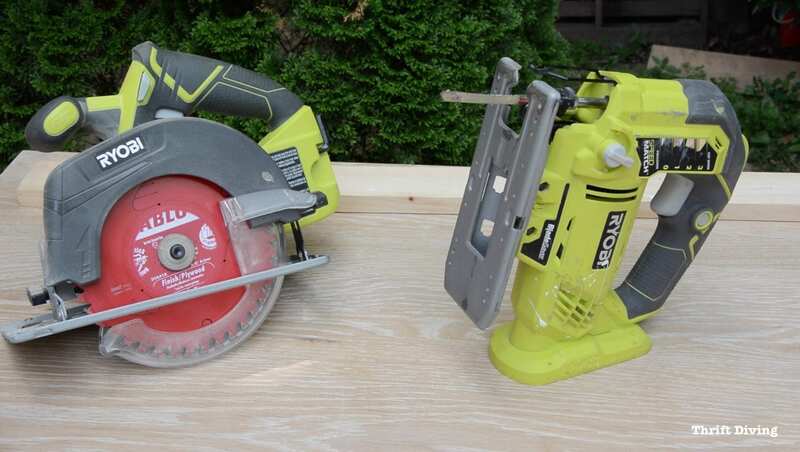 So What’s the Best Circular Saw? I use the RYOBI brand of power tools because they’re the ones on which I learned to use power tools. Over the years, they came to sponsor some of my projects and send me the tools I need to get those projects done. 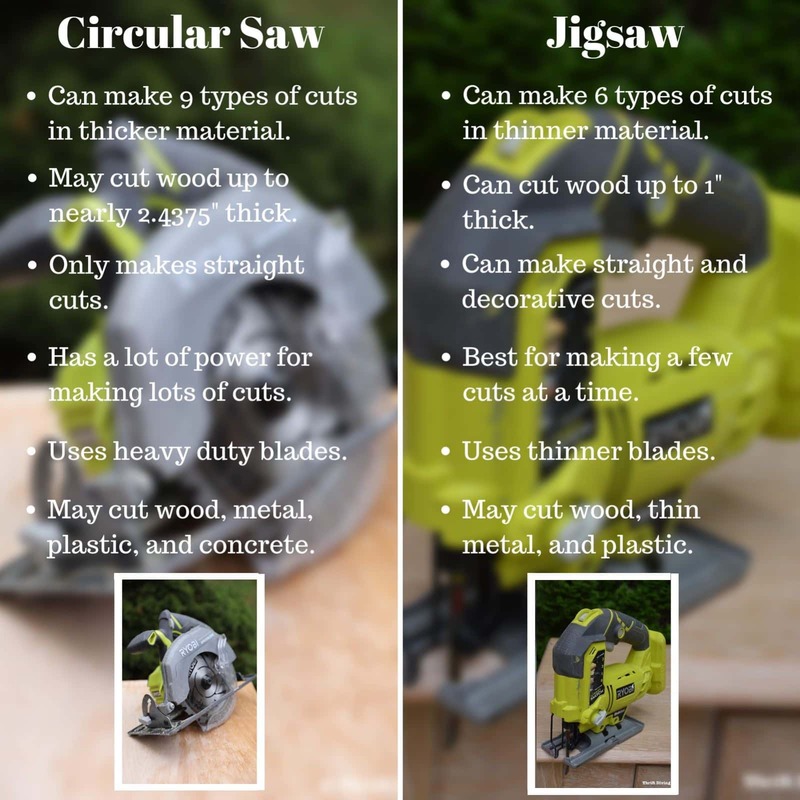 It’s hard to say what the “best” circular saw is because it depends on how you’ll use the saw, what you’ll be cutting, and your general preferences. For example, you may be DIY’er who simply needs a reliable, affordable tool to do occasional cuts for projects. Or, you may be a professional carpenter whose job it is to cut 2x4s all day when framing homes. Those two people will have different wants and needs. The most important question to ask yourself is, “Does this circular saw have enough power to complete the jobs I need to do?” And if the answer is “Yes,” then it’s the best circular saw for you, whichever one you choose. I’ve been very happy with my RYOBI circular saws and haven’t had any problems with them! Which side the blade is on (circular saws come as right-handed or left-handed blade, depending on which side the blade is located. If it’s on the left side, it’s a left-handed blade. If it’s on the right, it’s a right-handed blade. in this case, this is a left-handed blade). Blade lock button – When pressed, it locks the blade so you can change the blade when dull or by project. Opening to view – When cutting, this area allows you to peak down to see where you’re cutting. Ruler and guide on the front of the base. What’s the Best Size of Circular Saw? Circular saws are sized back on the size of their blades. But here’s the thing: you can’t buy just one circular saw and then put different sized blades on it. Nope. You would buy the size circular saw for the size blade you’d want. 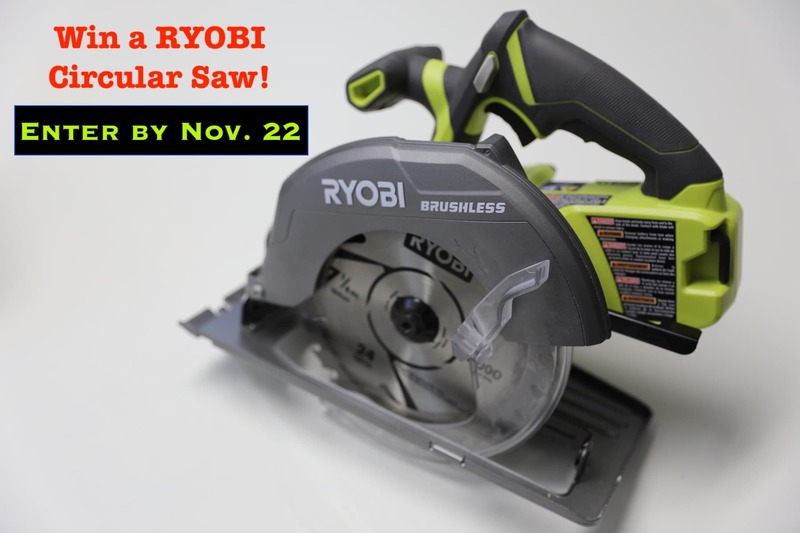 For example, I’ve got three different RYOBI circular saws: a 5 and 1/2″ one….a 6 and 1/2″….and a 7 and 1/4″ circular saw. The standard size is 7 and 1/4″ and I would recommend you consider getting that size. The rule of thumb is that the bigger the blade you’ve got, the thicker the material you can cut. I’d recommend you stick with the 7 and 1/4″ size, which has a deeper cutting capacity and is going to have more power. 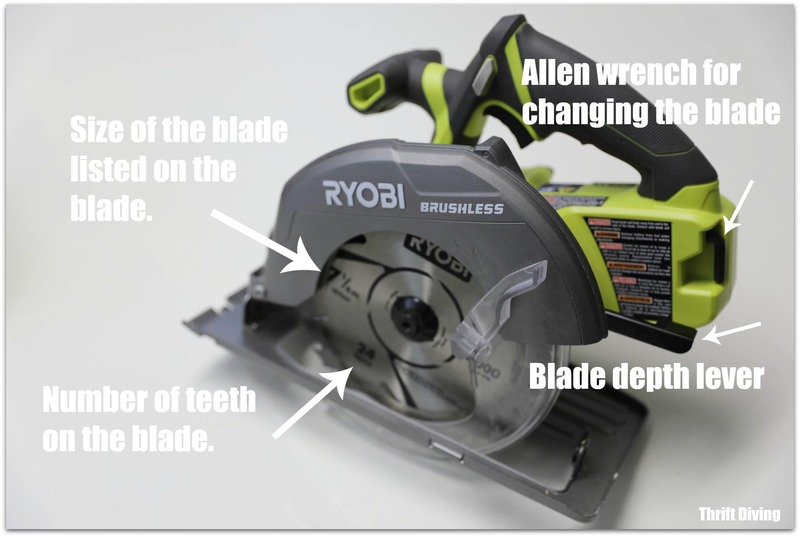 Circular Saw Blades: Which One Do You Use? 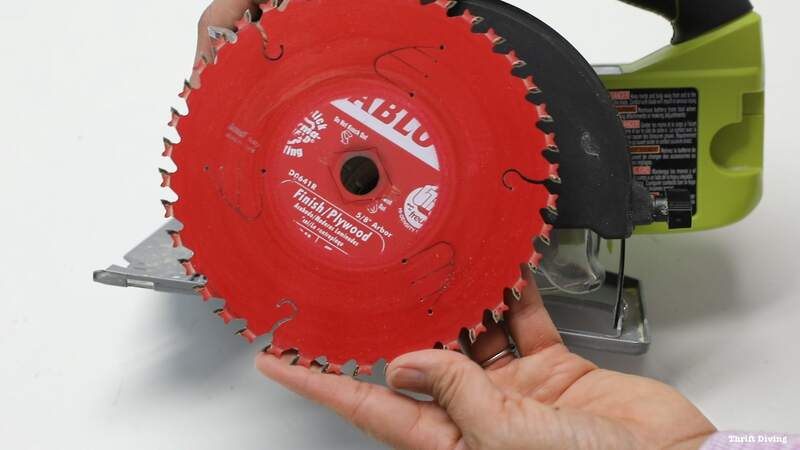 Most circular saws when you buy them will already come with a blade already installed, usually a 24 teeth blade. This blade is good for cutting 2x4s and general cutting, but if you want a smoother, more finished cut, or if you’re cutting plywood, you’d want a blade with more teeth. Blades will tell you on the side of the blade how many teeth it has and what it’s best used for cutting. In the case below, finish work and plywood is what is recommended to cut with this blade. 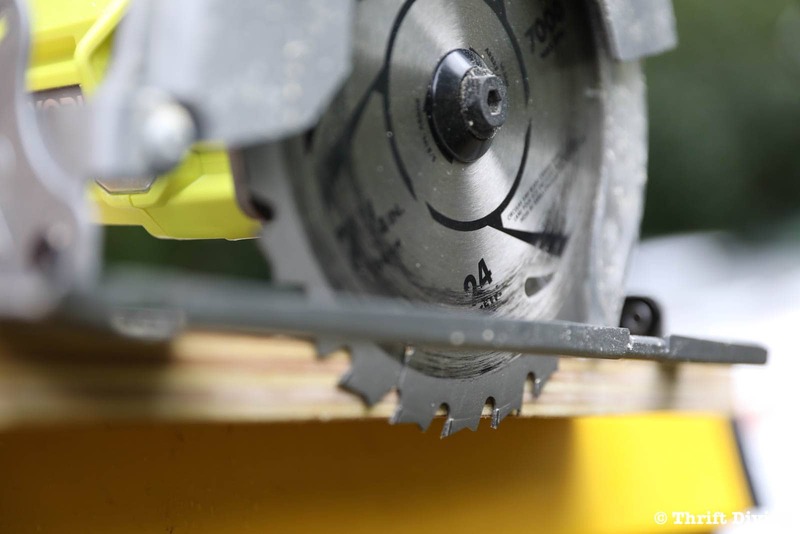 Ahhhh….so here’s a good question to consider: when should you use a circular saw and when should you use a jigsaw? Both the circular saw and the jigsaw are two of my favorite power tools and I use them interchangeably to cut wood, but the biggest difference between a circular saw and a jigsaw (besides the obvious difference that circular saws would be more powerful) are the blades, type of cut, the thickness of the material that can be cut, and the type of materials that can be cut. Jigsaws have smaller teeth on their blades and are for finer cuts and take longer to cut through wood. Circular saw teeth, on the other hand, are much larger and can chew through wood faster. Circular saws can only make straight cuts (although, as mentioned above, they can make 9 different types of straight cuts). 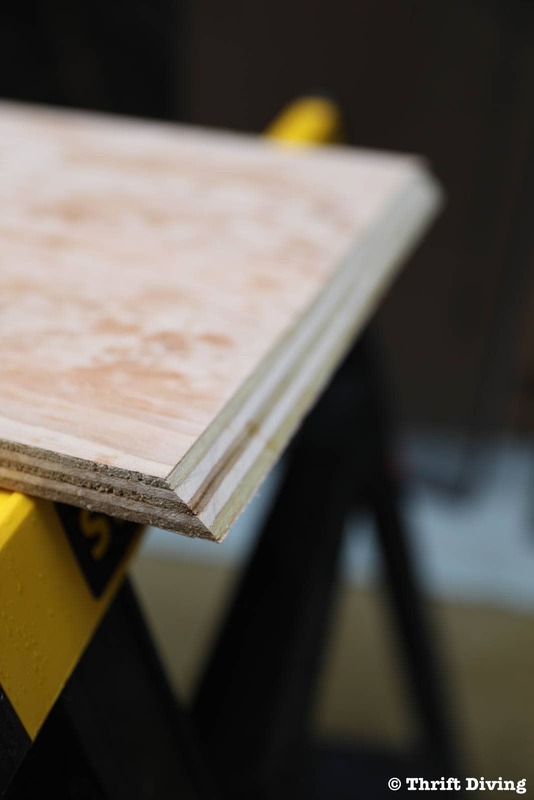 While a jigsaw can make straight cuts, too, a jigsaw can’t make dado and groove cuts and is inefficient at crosscutting and ripping large pieces of plywood. Jigsaws, on the other hand, can make decorative cuts with lots of swirls and loops, unlike the circular saw, which can only make straight cuts. 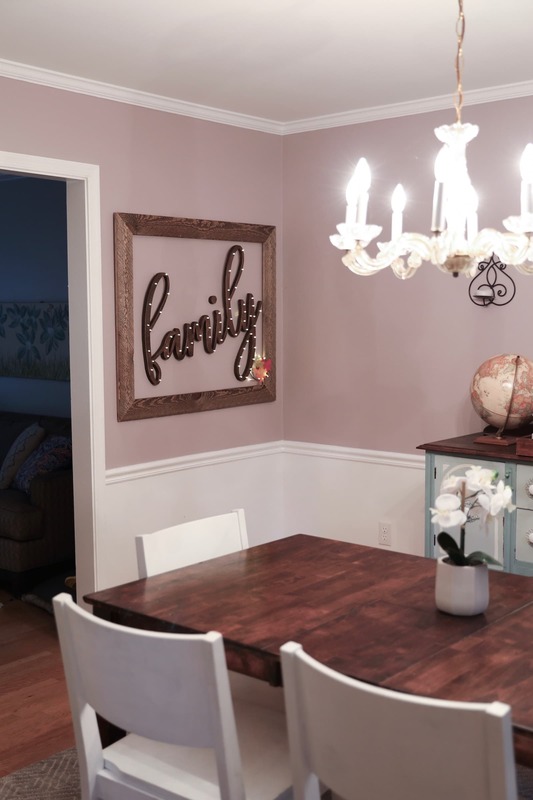 To cut out this lighted word sign for my wall, I used a jigsaw and 3/4″ plywood. I never would have been able to cut something like that out with a circular saw. Circular saws, depending on the size of the blade, can make deeper cuts than a jigsaw. A circular saw with a 7 and 1/4″ blade can cut wood up a maximum depth (at 90 degrees) of 2.4375″. 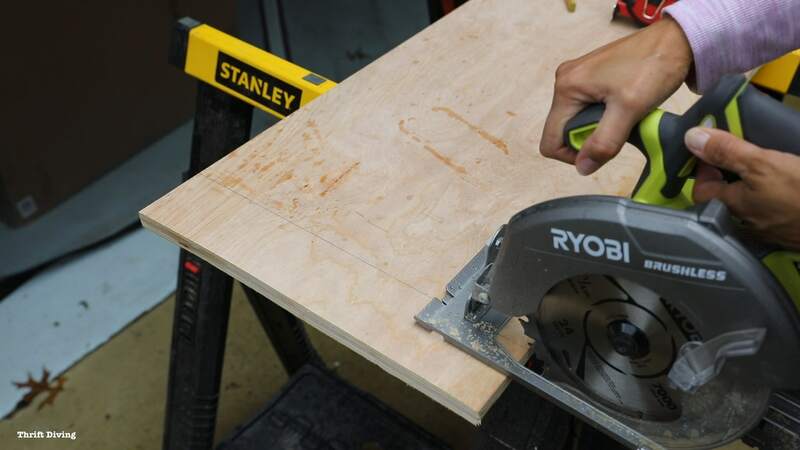 This means you can use a circular saw to cut a 2×4 board (which is actually 1.5″ thick). Jigsaws can only cut up to 1″ thick which means it’s perfect for 1″x2″ and 1″x3″ boards (or thinner) because those are actually only 0.75″ thick. 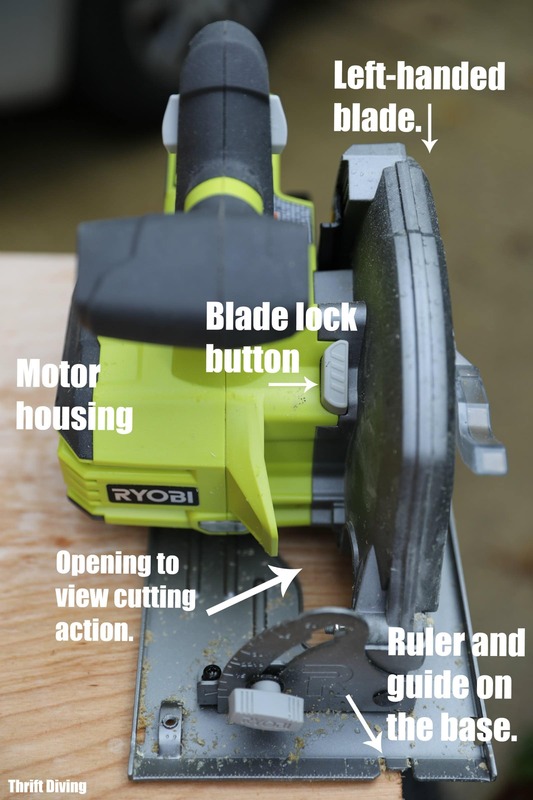 So after learning about why you need a circular saw in your DIY toolbox, along with when you would want to use a circular saw (versus when you’d want to use a jigsaw, for example), let’s talk about how to use a circular saw. 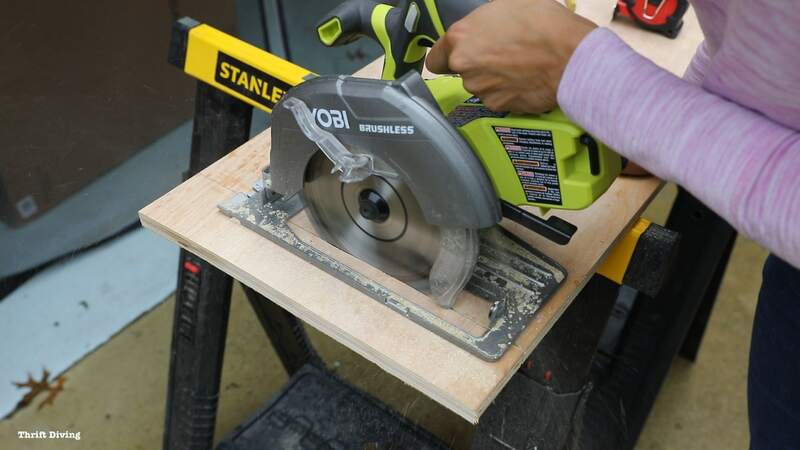 There are several ways to set up your workspace for using a circular saw (i.e. using sawhorses, using rigid foam, and clamping your material to a table. After you figure out what will work best for you, the next thing is to prepare to start cutting. *NOTE: Be sure to wear eye protection and hearing protection. All blades aren’t created equal. Remember this: the more teeth, the finer cut you’ll get. That’s true for any power tool you’ll use, including jigsaws. Pick the circular saw blade that will give you the type of cut you’re looking for. 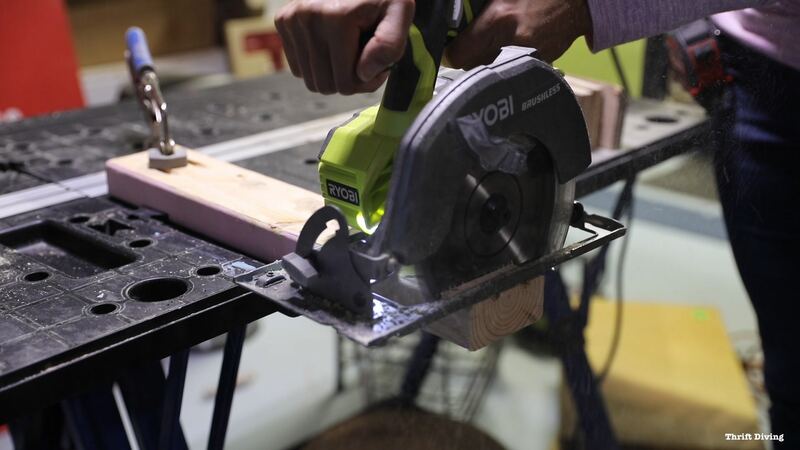 If you’re wanting to cut plastic or metal with your circular saw, make sure you buy the type of blade that indicates the blade can cut those materials. For this blog post, we’ll only talk about cutting wood. Using the knob on the back of the circular saw, lower your blade to no more than 1/4″ below the bottom of the wood. This provides enough clearance to cut the wood, but it also helps to preserve your blade (so it doesn’t dull quickly), and it’s safer to only expose enough blade to make the cut. 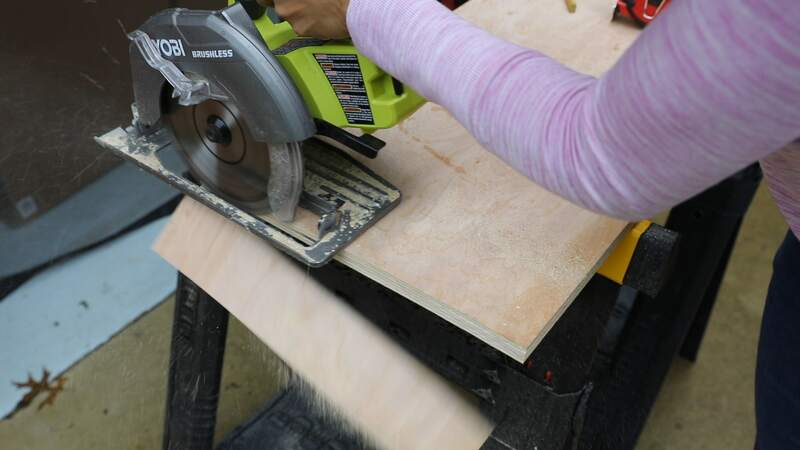 Before making a cut, let the blade run at full speed before letting the blade connect with the wood. 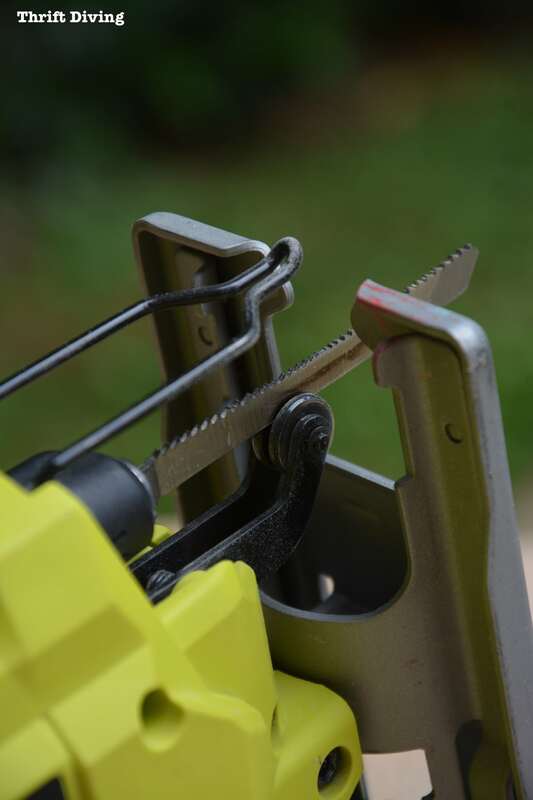 This makes for a cleaner cut and reduces the risk “kick back.” While your blade is away from the edge, line up the blade with the line (some circular saws have red laser guides and some don’t) before turning on the saw. Keep in mind that the width of the blade itself is about 1/8″ thick (this is called kerf). So don’t cut directly ONTO your line or else the thickness of the blade will cut into your measurement. You’ll be forever wondering why you can’t ever get a perfect measurement. 😉 Instead, cut a little to the side of your line (i.e. “save your line”), letting your blade slightly cut into the scrap side of your wood beside your line. TIP: Lay the right side of your wood face down to get the best cut. Circular saw blades cut on the upstroke. Therefore, the wood on the bottom gets the cleanest cut. To minimize tear-out on the back side of the wood, you can use painter’s tape to minimize chipping when making your cut on the painter’s tape. STEP 4: Make Your Cut! Once the blade is moving at full speed, move the circular saw forward and let the blade do the work. Be sure that there is nothing under your project that could snag the blade. Let the blade fully stop when you’ve come to the end of your cut before lifting it up. Always remove the blade before making adjustments to the saw. Wear eye protection and hearing protection. NEVER cut a board or any other material down the middle when it’s resting on two supports. This will cause the blade to pinch. Always allow the scrap material to fall away during a cut. Always wear form-fitting clothes when using power tools; nothing dangly. It’s Easy to Use a Circular Saw, Right? Seriously, isn’t that easy?? The hard part is getting over your nervous feelings over using a circular saw for the first time. But if you follow these instructions, read the manual, and watch this YouTube video, you’ll be able to make your first cut! Visit RYOBI Nation to sign up for a free account. Post a link in the comments section below this post sharing with us which project on RYOBI Nation you would like to make! 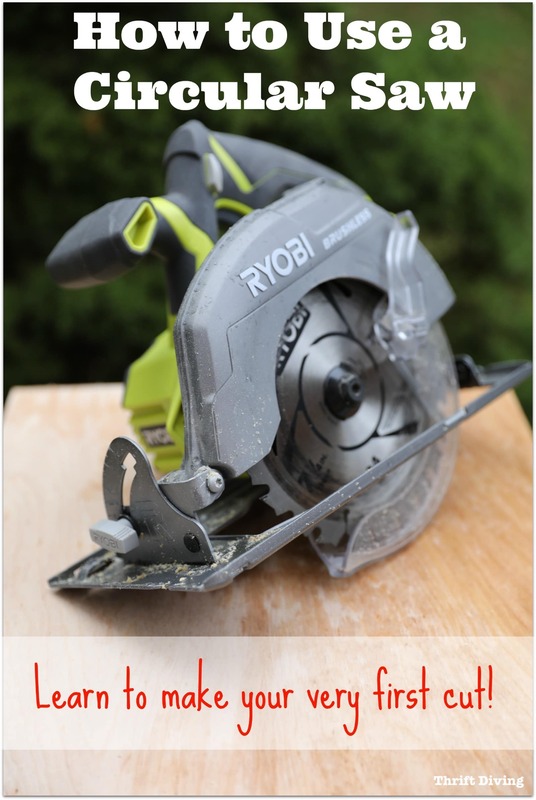 Share this circular saw tutorial on Pinterest! Did you find this circular saw tutorial helpful? Be sure to click here to save it! « We Got Rid of Cable….But Reconnected 5 Years Later. Here’s Why. Inspiring couple has, well, inspired me to make a new Cal King Bed with Rustic Headboard. With the power port! Can’t wait to get started on this new project @ https://www.ryobitools.com/nation/projects/h-leg-table_14511. My kids need more toy storage so this Toy Box looks great. The project that interests me most right now is the mud room/garage locker. I could definitely use a smaller, modified version in my garage. I’m just beginning to look at buying some basic tools, such as a saw, a sander and a smallish work table. I currently have only a drill and a cordless jet blower along with a small toolbox with hand tools. I would love, love to win a circular saw. Thanks for the opportunity. First of all, this is such an awesome post!!! Thank you for taking the time to explain what each saw does, and include photos. The Ryobi project I would make is the entry table. I’d like to make a window seat – that’s always been a dream of mine. 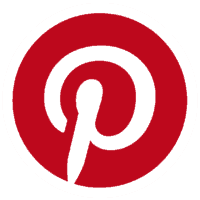 I would like to make an Entry way board – I like that you can post on it and hang your keys. For my first project, this seems very sensible…I believe I can handle it. Your tutorial was amazing and educational. I would really like to make a tufted queen headboard and a detached 6 tier storage shelve for a small bath room. You are Awesome! Thanks so much for your training. I would like to make the Carpet Ball table. We have one at our church but this one looks more sturdy and the kids love to play it but sometimes get frustrated with having to wait.